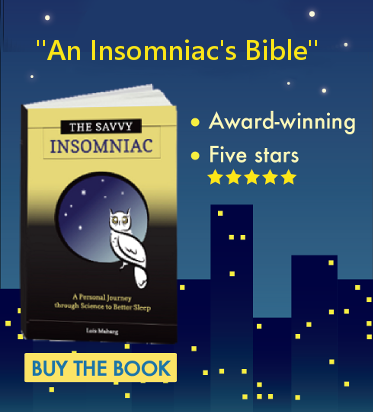 “When I try to analyze my sleep problems,” she wrote, “I feel I’m possibly confusing being a nocturnal person with insomnia. I’ve always wanted to stay up late. I feel like I’m about 3 hours behind the rest of the world. No matter how tired I am in the evening, I still can’t go to sleep till early in the morning! “Sometimes just knowing that I have to get up earlier than usual for a meeting or having to catch an early flight makes me crazy and not able to sleep. Then I try to regain what I lost in sleep the following morning. On some days I don’t get in to my office until 1 p.m.!” Other than take sleeping pills, she wanted to know, what could she do that would help her get to sleep at a reasonable hour? It’s no fun being a night owl when you have to march to the beat of a corporate clock. Getting up at 7 a.m. may be easy for those who fall asleep by midnight, but it’s much harder if you can’t fall asleep till 3. You’re a zombie at early morning meetings, spilling coffee and forgetting papers and keys, and then slogging through the day with what feels like a whopping hangover. This inclination to want to go to sleep and get up late is not a matter of choice; one in 10 people are genetically programmed to experience what doctors call Delayed Sleep Phase Disorder, or DSPD. The body clock simply runs on a later schedule in people with DSPD. Here are a couple ways to shift your biological rhythms so that you feel like going to sleep earlier. One is to expose yourself to bright light for a few hours right after you wake up, every day. Sunlight works best—but taking a walk or sitting by a window may not be in the cards if you have to get yourself ready for work or get children off to school. Another option is to use a light box. While sitting beside a light box for two hours straight may not fit into your early morning routine, time with the light box can be interspersed with taking showers, getting dressed, making breakfast, and other early morning activities. The idea is to spend as much time by the light box as possible in the first few hours after waking up. The other way to shift your biological rhythms forward is to use melatonin supplements. But taking melatonin according to the instructions on the label—an hour before bedtime—is not going to help. To get a sizeable phase-shifting effect, you have to take it around dinnertime. Specifically, 3 mg of melatonin taken seven hours before the time you actually fall asleep will give you the biggest bang for the buck, according to Charmane Eastman, director of the Biological Rhythms Research Lab at Rush University Medical Center, whom I interviewed last year. As is true of bright light, melatonin has to be used daily to keep your body clock from shifting back to its natural cadence. A combination of bright light and melatonin supplements works even better than either therapy alone. Not being a night owl myself, I can’t speak from personal experience here. But research shows these therapies to be effective for a majority of night owls wanting to sleep more “normal” hours. If you’re a night owl, does your work allow you to sleep in late, or have you had to adjust your sleep schedule to start work early? How have you done it? Under “Melatonin Supplements” you write: Specifically, 3 mg of melatonin taken seven hours before the time you actually fall asleep will give you the biggest bang for the buck. Please clarify. Do you mean the time I actually fall asleep (now), or do you mean the time I WANT to fall asleep. I currently cannot fall asleep before 2am, however it is frequently 5 am or not at all. I would love to fall asleep between 9 and 10 pm like I did before. And this is not genetic for me. LOOONG term insomniac. 1st Dr. said she could no longer help me (I had grown tolerant of all “1st line” sleep meds and it took a year to find a sleep doctor. During that year I pretty much did not sleep with the exception of micro naps. Really messed me up. Now I have been “let go” by the sleep doctor. I can’t go through another year like that. He said to take 4 of the melatonin 1 hr before I want to go to bed (taking at 9pm). I am taking 6. No change. FYI, I have not done the light therapy per se because I have always had my coffee and started my day outside. I do not work (THANK GOD) so I have not had to deal with work but I have wondered what I will do if I go back to work. But life frequently does not let me sleep in. Dr’s appointments are the worst. My husband likes to make 7am appts when he knows I get to bed between 3-5am usually. Grrr. Anyway, please clarify my question. I am going to try your idea. What could it hurt at this point, right? When the researchers whose work I’m talking about here tested melatonin supplements to see how best to shift the timing of people’s sleep, they used 3 mg and 0.5 mg doses. If you want to fall asleep earlier and are going to use the 3 mg dose of MT, you’ll get the biggest shift if you take it 7 hours before you naturally feel sleepy enough to fall asleep. If your natural bedtime is 2 a.m. (it sounds like this is the case for you—or maybe your natural fall-asleep time is even later), you’d take the supplement 7 hours before that, at 7 p.m. Keep track of when you fall asleep each night, and keep adjusting the time you take the supplement to 7 hours before you’re actually falling asleep. 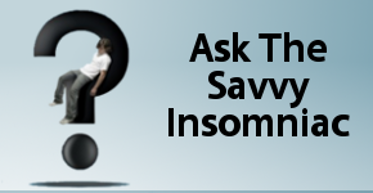 If you decide to use the 0.5 mg dose, you’ll want to take it 5 hours before you naturally fall asleep. Proceed as stated above. The time you WANT to go to sleep makes no difference in this process. The phase response curves these recommendations came out of were based on the natural internal melatonin cycles of the subjects who were tested and the time they naturally fell asleep. You may never be able to fall asleep between 9 and 10 p.m. It’s possible, though, that with the help of melatonin supplements you’ll be successful in shifting your sleep forward by at least a few hours. Melatonin is quite safe. So you’re right, at this point, it can’t hurt.